New iPad Third-Gen Announced – Price, Features, Availability – Everything You Need to Know! The day has finally come. Apple has finally pulled the curtain on what they are calling as the “new iPad”, and we finally know for certain what the device has in store. Some of the more sensible rumors about the iPad 2’s successor – most of which were outlined in an earlier post – have come to fruition, and we have a roundup of everything new in the third-gen iPad as announced at this morning’s San Francisco press event right here. As many have anticipated, the storage tiers – and their respective cost – remains the same as the previous-generation iPad, even factoring in the new 4G LTE support; basically, there are WiFi models, and there are WiFi + 4G + 3G models. Coming in 16GB, 32GB, and 64GB flavors, the new iPad starts at $499 at the base model and goes up to $829 for the 64GB WiFi + 4G + 3G model. 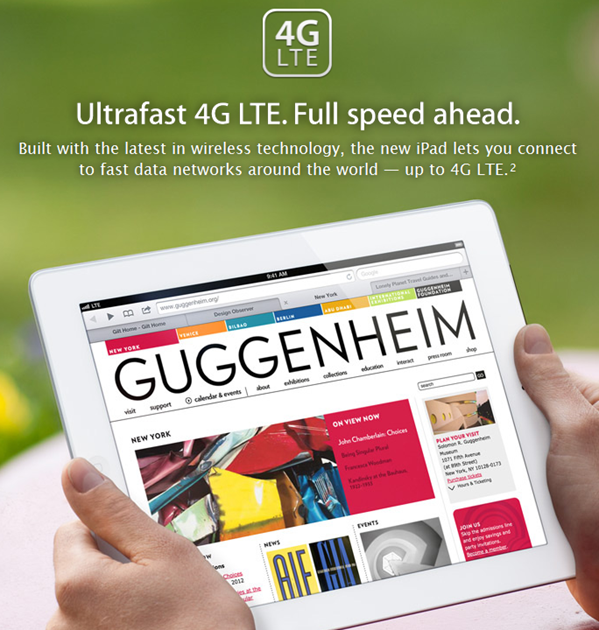 As rumored, the new iPad now has support for 4G LTE. 4G-enabled devices will be available through both AT&T and Verizon in the US. Advantage of LTE? Blazing fast download and upload speeds, therefore you can rest assured that your webpages, tweets, emails etc. will fly off in a snap! It supports HSPA+ for up to 21Mbps, and dual-carrier HSDPA for up to 42Mbps. LTE for max up to 72Mbps. Third-gen iPad “remains amazingly thin at 9.4mm and light at 1.5 pounds”. 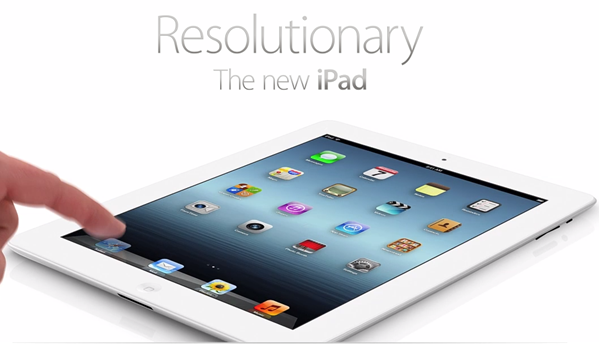 The design remains unchanged, and looks exactly like its predecessor which is the iPad 2. Battery life also remains same at 10 hours, and 4G is at 9 hours. 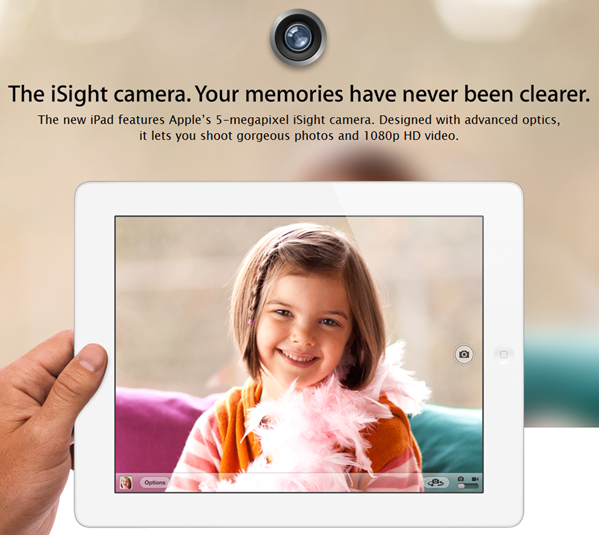 Retina Display – a feature that, to some criticism, was not implemented in the iPad 2 – has made its way into the new iPad. While the screen is still 9.7 inches in size, it certainly packs more pixels than that of its predecessors with a notorious screen resolution of 2048×1536. As everything on the screen will be far more crisp, things such as browsing the web and reading an iBook will be far more pleasant. This will also appease those of us who were spoiled by the Retina Display on the iPhone 4 and 4S; it will be nice to no longer notice the pixels starting at me. 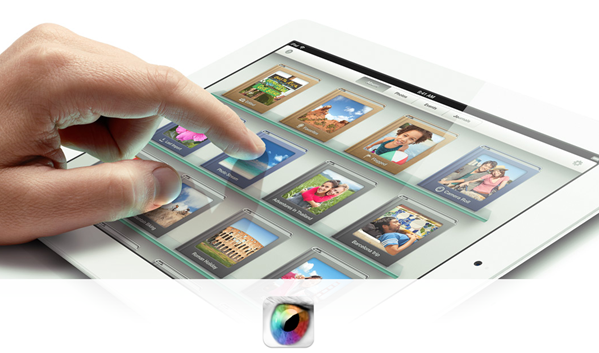 We’re guessing that the Retina Display will be an instant hit in high defers who crave for 1080p movies on a tablet. We’re also seeing improvements being made to the device on the hardware front. As rumors suggested, the device is packed with a new A5X processor. This new CPU will provide greatly-improved performance over the already-phenomenal A5 chip. The iPad third-gen also offers 4 times the graphical performance of the iPad 2, thanks to the new Quad-Core GPU, while still maintaining the same battery life that the iPad is known for. On top of these improvements, the new iPad also likely sports 1GB of RAM, which is double the amount currently inside the iPad 2. One flaw with the iPad 2 has been its sub-par camera. The new third-gen iPad now sports a 5MP rear-facing camera, allowing it to take far better pictures than its predecessor, and it also supports 1080p video recording, while the front-facing cam is likely same as the iPad 2. The iPad 2’s lack of a proper camera is something that I didn’t mind as I never use my iPad for photography purposes – holding one up to take a photo in public has been the source of quite a few funny pictures on the Internet – but improvements are welcome nevertheless. The front-facing camera improvement is surely great for users who frequently use FaceTime on their device. An incremental update to iOS, iOS 5.1 will be bringing Siri dictation to the third-gen iPad, among various other improvements. There have been quite a lot of people that have wanted Siri on the iPad, but at the moment, it look like they will have to settle with dictation feature only. If you’re itching to get your hands on the new iPad, you better act fast; it’s sure to be extremely difficult to purchase physically, so your best bet is to pre-order. You’ll still have to act fast though; pre-orders are available starting today. If you don’t put in your order early, it’s likely that you’ll have to wait longer for your iPad to ship. However, if you plan to pick your iPad from a physical Apple Store, then the official date given by Apple is March 16th, be sure to be early otherwise you’ll be facing an ultra long wait in line. For more information on the newly announced iPad, head over to the official iPad page on Apple’s website.